Although drug abuse can normally cause California parents to lose their child custody rights, a Los Angeles appellate court has ruled that a parent’s use of physician-prescribed medical marijuana outside of the presence of his child was insufficient evidence to prove drug abuse or addiction. In a recent 3-0 ruling, California’s Second District Court of Appeal overturned a Superior Court’s ruling against a father who admitted to smoking marijuana four or five times per week in order to alleviate arthritis pain. The ruling of the lower court required the father to allow child-protective agency supervision, enroll in parenting courses and drug counseling, and submit to random drug testing. The case allegedly began after a social worker visited the father, identified only as Paul M., who had sole custody of his nine-month-old son, Drake, in May 2011. After Paul reportedly described his doctor-prescribed marijuana use and the measures he took to keep it away from the infant to a social worker, the agency asked a court to place the man under its supervision. According to the county agency, Paul was incapable of properly caring for the infant despite that Drake was healthy and purportedly exhibited no signs of neglect. Paul reportedly testified that he did not drive under the influence of marijuana. Paul also claimed that he ensured his adult daughter cared for Drake while he smoked the drug in the garage where he purportedly kept it in a locked box. According to the appellate court, merely using marijuana is not sufficient to show the type of drug abuse that can affect child custody decisions. The court also stated drug abuse must be diagnosed by a physician or evidenced by an individual’s behavior. Because there was allegedly no reason to believe the child was exposed to marijuana nor was there any evidence that Paul was a drug abuser, the Second District Court of Appeal overturned the lower court’s decision. It is currently unclear whether Los Angeles County intends to file a further appeal with the California Supreme Court. In California, many factors play a role in child custody decisions. Although California law prefers each parent to share custody of their children, this is not always possible. Child custody decisions are normally made based upon the best interests of the child. Factors such as the child’s age, physical and mental health, the lifestyle of each parent, parent-child emotional bonds, any history of abuse, each parent’s ability to care and provide for the child, and other factors will all be examined by a judge. Child custody and visitation is normally an emotional topic. If you are a parent who has questions regarding child custody matters, please contact Doppelt and Forney, APLC today. Mr. Doppelt is a skilled San Diego family law attorney who has more than 20 years of experience representing clients in Southern California. Doppelt and Forney, APLC serves clients in Scripps Ranch, Linda Vista, Encinitas, San Diego, and throughout Southern California. 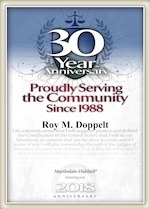 For a free consultation with an experienced and hardworking family lawyer, contact Doppelt and Forney, APLC through the law firm’s website or give us a call toll-free at (800) ROY IS IT (769-4748).